Never avenge yourselves. Leave that to God, for he has said that he will repay those who deserve it” (Romans 12:19a TLB). 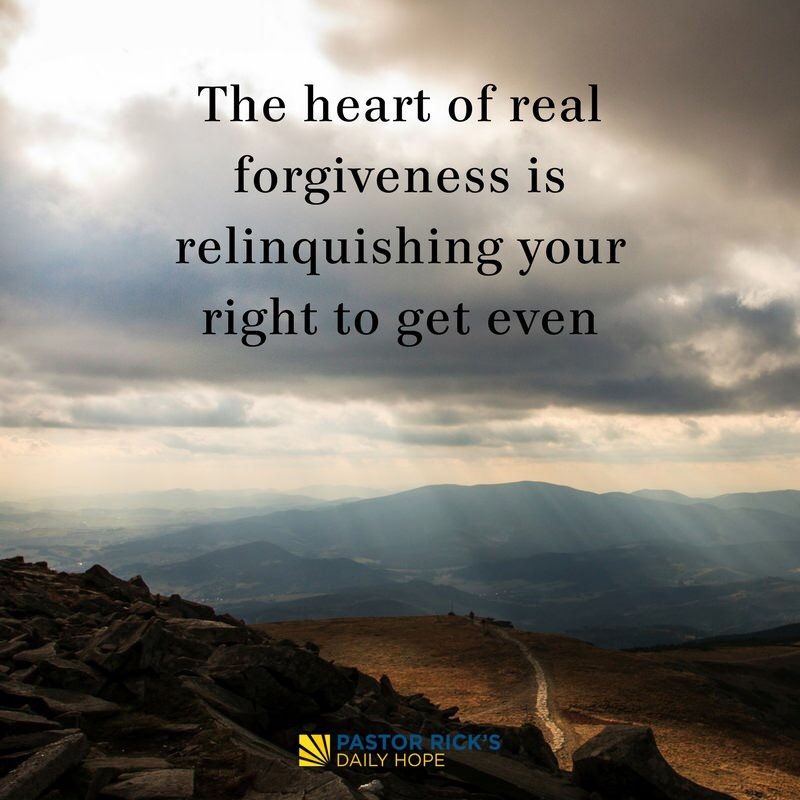 The heart of real forgiveness is relinquishing your right to get even. The Bible says in Romans 12:19, “Never avenge yourselves. Leave that to God, for he has said that he will repay those who deserve it” (TLB). You say, “If I give up my right to get even with somebody who’s hurt me, then that’s unfair.” You’re right! It is unfair. But whoever said forgiveness is fair? Was it fair for Jesus Christ to forgive everything you’ve ever done wrong and let you go free? No. We don’t want God to be fair to us, though. We want God to be gracious to us. We all want justice for everybody else and forgiveness for ourselves. The truth is that life is not fair. And forgiveness is not fair. It’s called grace, and God has shown it to you. One day, God is going to have the last word. He’s going to settle the score. He’s going to right the wrong. Leave the justice part to God. You just concern yourself with forgiving so there can be peace in your heart and you can get on with your life. If you don’t do this, you will fall into the trap of bitterness. Resentment and bitterness are worthless emotions. In fact, doctors tell us they are the unhealthiest emotions. They will eat you alive like cancer. All your resentment and bitterness toward people who have hurt you in the past isn’t going to change the past, and it certainly won’t change the future. All it can do is mess up today. When you hold on to resentment, you allow people from your past to continue to hurt you today. And that’s not smart! The people in your past are past. They cannot continue to hurt you unless you choose to hold on to the hurt. Instead, let go of your need to get even or make things fair. Leave it up to God. This entry was tagged forgiveness, let go and let god, letting go, rick warren. Bookmark the permalink.